Cuisine: International with mainly French brasserie type of influence. A sister restaurant to Texture, Michelin-stared high dining venue in central London, the first 28°-50° was open at Fetter Lane in the City. Just recently, the already well-established Wine workshop and kitchen welcomed another sibling – its Marylebone branch. 28°-50° is named after the Earth’s latitudes between which it is in general possible to grow grapes and make wine. Atmosphere: Invigorating yet sophisticated. The people who come here do not drink to get drunk, but to enjoy their favorite drink – wine in its all forms. 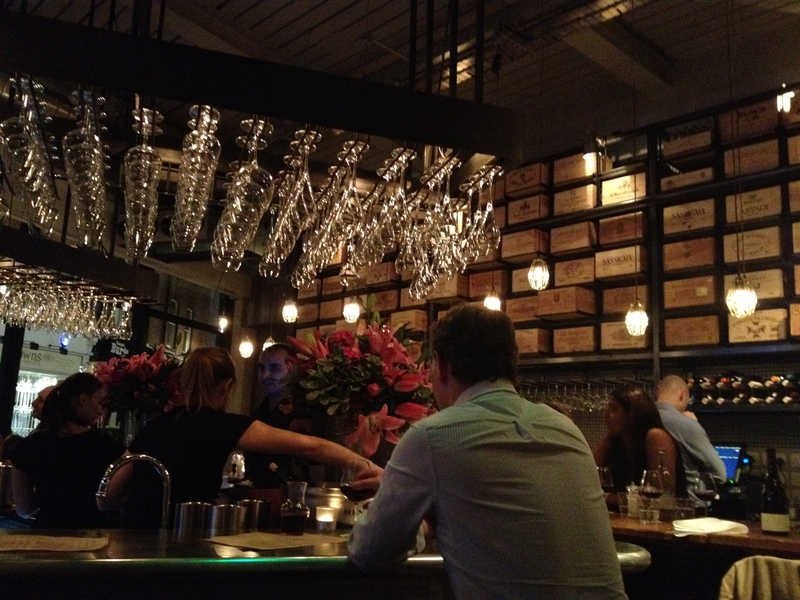 The waiting staff and sommelier are very friendly, helpful and it is evident that they love what they do. The interior is bright and designed thoughtfully with wine glasses hanging above the bar and wooden cases of wines cover the back wall. The small area downstairs is more private and you can watch the kitchen buzz as the hand of the open kitchen concept. Chef: The executive chef Paul Walsh creates original dishes from lighter to heavier so they can be easily matched with the wines on the list. 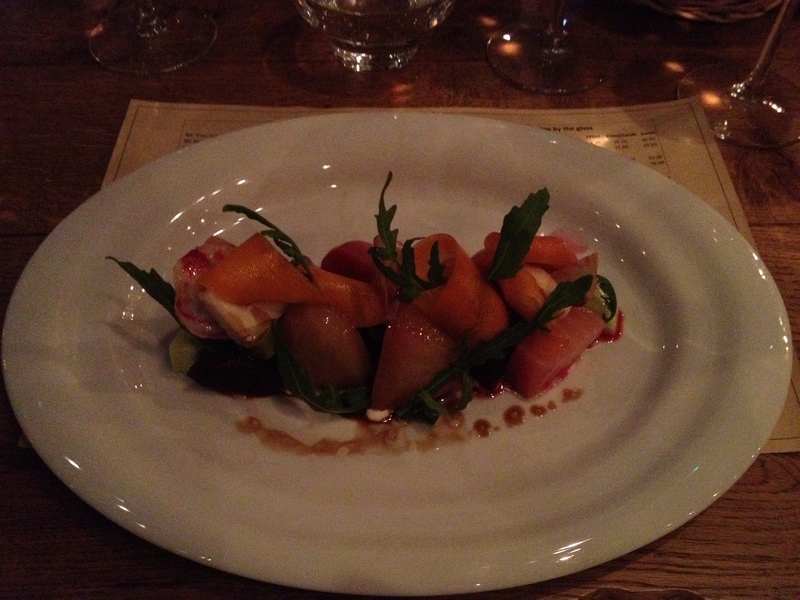 Food: Small and large options for salads, starters and soup dishes are a very handy option at a place focused on wine. You can get a different dish with each wine you are having to suit each other. Starting with something fresh, tasty and ideal for the glass of white wine I have ordered, I picked the Beetroot Salad with pickled carrots, goats cheese and horseradish yoghurt. The various colors of beets offered distinct flavors. The yellow were more sweat, the reds more juicy and the soft goats cheese rings sandwiched between the veggies just balanced them both. An exquisite sauce for this dish in the form of horseradish yoghurt had won my palate over immediately so I was the more happy when my next plate or rather a board arrived with a side pot full of this delicacy. 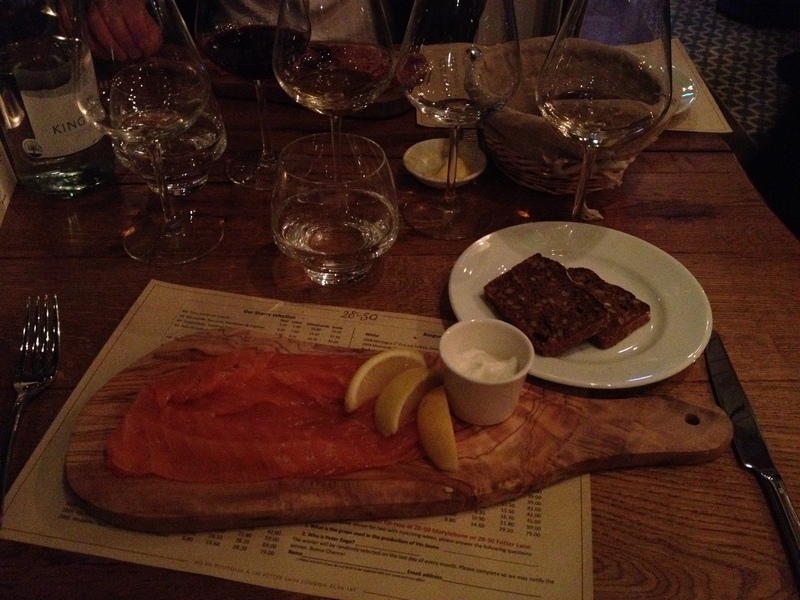 The Smoked salmon was excellent as I would expect in London supplied by superb salmon from Scotland. I continued with a glass of another white wine, this time with a Pinot Blanc from Alsace, which was exactly that type of wine I wanted with my salmon. Crisp yet aromatic with lovely acidity cutting through the fatness of the fish. From the starters the Tomato Tart with olive tapenade and goats cheese is another superb treat. It is affluent with tomatoes and the thin crust of the tart is crunchy and light so you can manage another appetizer or a main course easily. At a wine place a plate of sliced meats and ham cannot be missed on the menu. The Charcuterie selection With pickled vegetables, toast and wholegrain mustard will accompany any full-bodied wine. A spicy Rhone Syrah or Italian Barbera would do a great job. Another meaty delicacy is the Scottish beef Burger served with tomato and relish. A highly popular feature of the menu as I have seen it on many tables. Juicy red wine will again lighten up this filling dish. Although cheese is not the best partner during a wine tasting since often its intense aroma can hinder the wine’s flavors, it is still the favorite companion for wine while enjoyed at a restaurant or bar. At 28°-50° the Cheese selection is served with onion chutney and bread. If you are not finishing with cheese then the desert menu might be worth peaking at. From the Crème brûlée and Ice cream selection to Fresh fruit salad for the health conscious diners, you can find the right treat for yourself. A glass of port, sherry, madeira or a sweet wine from Spain will envelop the wine evening into a lovely gourmet escape from the busy office environment of central London. Drinks: Perhaps the main reason for you to stop by are the drinks. 28°-50° is proud to offer “more than 30 wines available by the glass, carafe and bottle at exceptional prices”. And that is absolutely correct and exciting. Moreover, many of the wines are off-the-beaten-track findings, so you can explore something new without a risk of being disappointed. The knowledgeable staff willingly explains what each wine is about and if you are still in doubt you might get a small taste before you order a glass or a caraffe. Both places are also supporting the BYO scheme (Bring Your Own wine), for £15 charge per bottle. Although there are some restrictions. They “allow only 1 bottle per couple and by prior arrangement with the management”. BYO are not accepted on Friday and saturday nights. But I think the wines on their list are so good and so well-priced that it would be a waste to bring your own wine. Looking for something on WINEBEING? Winebeing by Radka Slovackova is licensed under a Creative Commons Attribution-Non-Commercial-Share Alike 2.0 UK: England & Wales License. Based on a work at winebeing.com.